Good Morning! Here's my card for today's Twisted Tuesday Challenge which is a free for all challenge so I hope you'll play along with us this week and be sure to stop by and check out the other DT member's cards! I also made these cards for Monday's technique lover challenge on splitcoast stampers. I wanted to try this technique that I've been seeing lately. It's called seamless tiers or some people are calling it triple stamping. 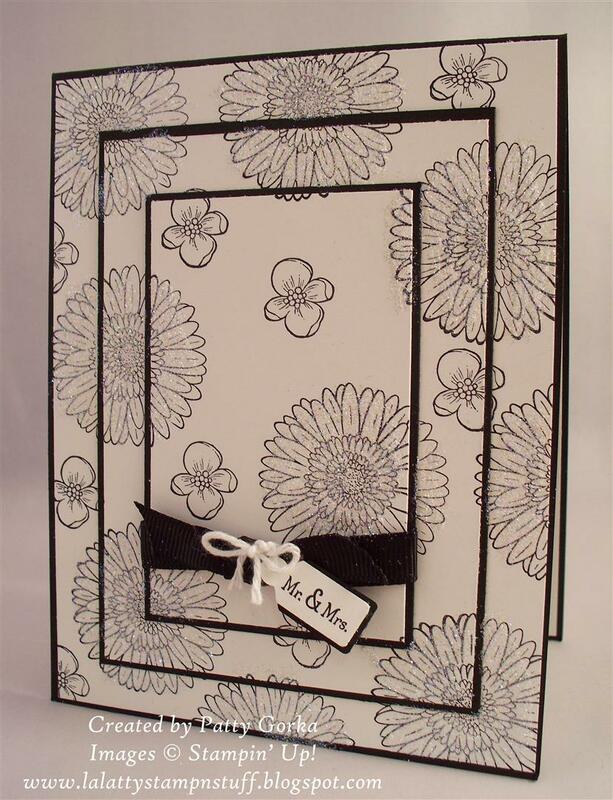 Basically all you are doing is taking three sheets of white card stock and placing them on top of each other and then begin your stamping. You will want to pick a stamp that is big enough to cover at least 2 of the three layers. I'm going to make a video showing this technique so that you can better understand how to do this. I'll post the video below. Below is a close up photo of my card. I wanted to try and show you the glitter on my card; it's really sparkly in person. I also wanted to list the measurements of the wisteria wonder (purple) and the black layers on my cards. There is 1/8" difference in each layer. My finished card size is- 5 1/2" x 4 1/4" the next white layer is 5 3/8" x 4 1/8"
The next layer (black/purple card stock) is: 4 1/2" x 3 1/4" and the white card stock is: 4 3/8" x 3 1/8"
My smallest layer (black/purple card stock) is- 3 1/2" x 2 1/4" and the white card stock is 3 3/8" x 2 1/8"
And here's my video. I made another card using this same technique. I hope you like it. After having so much positive feedback from my first video (thank you so much) I think I'm going to try and post one video a week :) Thanks so much for stopping by! Feel free to pass along the link to my blog so that others can see my video too. This is the card I made in my video. I decided to add a small tag using my jewelry punch and tiny tags stamp set. I also ended up adding some glitter using my 2 way glue pen and dazzling diamonds glitter. I've been wanting to make one of these cards as they as so neat looking. Your cards are beautiful! I enjoyed your video ... thanks for sharing! This is beautiful! Great video. LOVE it-my favorite is the black and white one! Pam is right, it is really neat!!! Wow. I saw someone else do this on SCS and it was gorgeous. So is your card. Might have to try it soon! 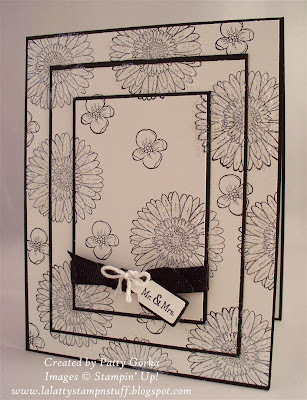 Wonderful Card---I too want to try this card as I have been admiring them! Thanks for sharing. I appreciate your insight and creativity. I do have a question. Which glitter did you use, and how do you use it? I have the dazzling details but it doesn't turn out so dazzling for me, lol. Maybe you could do a video on it someday, or maybe I'm the only one glitter challenged. fiddlinfan- I wasn't able to answer you through email so I'm hoping you see my message for you. I just used my 2 way glue pen and some dazzling diamonds glitter. I could do a video with different ways to use glitter- and I think I will do that next week. That's a wonderful idea! So beautiful and true to your creative style. Everything works together perfectly.